So, you’ve skied this year and you’ve decided it’s time to get your own boots, or maybe, if you’re like me, you’ve had your boots for a decade and are thinking it’s time to get some new ones… Where do you start? Buying new boots can be a confusing business. There’s so much to consider! Weight, stiffness, heated insoles, width, canter, etc. What boot is right for your competency level? The end of season sales are beginning and some of the boots are -50%, that must be a good deal? Right? Well here are 15 steps to get the right boot. Most importantly, don’t go for the deal! Spend every penny of your budget on the right boot, not the best deal! You won’t regret it. 2. Clear your diary! Choosing boots and getting them heat moulded takes time. 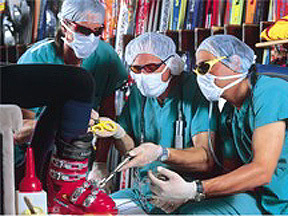 For ski boots, in particular, the fitting may take up to two hours, and involve more than one visit if you’ve got problem feet. 3. Clip your claws Get the clippers out and trim your toenails – it’ll help you get the best fit. 4. Wear a single pair of ski or board socks But remember to wash them first – cheesy feet won’t endear you to your boot fitter. 5. Ditch the skinny jeans Take some shorts or make sure trousers are loose enough to roll up above the knees – or you’ll have to strip off. 6. Use a specialist retailer Well-trained staff at the shop will find the boots that suit your feet. 7. Never buy online Or off the shelf. The fitting process in the shop is crucial. 8. Get the staff’s full attention Avoid busy times, such as Saturdays, and head to stores well before the season starts, to get a wide choice of stock. 9. Factor in temperature It’s especially important when testing the flex of ski boots – they’ll be softer in a warm shop than they are at the top of a 3000m peak. 10. Trust your fitter Boots don’t come in standard sizes so let shop staff guide you to the brand and size that fits best. Expect to try a few. They may feel a little tighter than you’re used to, but give them time and the lining will pack down. 11. Speak up! Your feedback is key, so be as exact as you can. If you are unsure about anything, just say so. 12. Be honest about your ability If you buy boots that don’t match your skills, they could be very uncomfortable and inhibit your improvement. 13. Do them up properly To get the best fit for ski boots start with the cuff clips to pull the foot back, then do up the instep and toe clips. For board boots tighten both liners and outer boots, and check your heels are sitting right in the back of the boots. 14. Learn the lingo To avoid being mystified by boot fitter techno-speak, familiarise yourself with the key boot components. 15. Forget fashion Buying a pair of flashy boots might boost your slope cred, but they may not be right for you. Comfy boots that perform well are cooler than those that give you bunions and squish your toes.